You'll also use your card to prove your identity when writing final exams. If you need to prove that you're a student to another person or organization (like a bank to get a student account), you can print a Confirmation of Enrolment from PAWS. 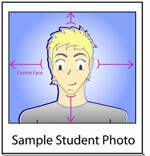 It will show that you are registered in classes as a full or part time student. As a registered student, your first card is free. Additional replacement cards/lost cards will be issued at a cost of $20.00. If the information on the campus ID card is worn or if the card is cracked, the fee will be waived. You do not require a new campus ID card every year. Your card is automatically activated when you register in at least one class. Even if you are not enrolled in classes for a year or two, your card is reactivated when you return; so hold on to that card in the meantime. You can order your ID card online and pick it up in person. Online orders for new campus ID cards typically take 2 business days to complete and will be available to pick up at the Card Office located in the Shop usask Bookstore. Be registered for classes a minimum of two days prior to requesting a student ID card. The photo must be a close-up of your head and shoulders shot on a plain light background with direct view of your face so that your face covers approximately 65% to 75% of the photo. See a sample on the right. Cards can be picked up at the main campus Shop usask Bookstore (see map below). You'll need to present government issued photo ID when you pick up your card. You can pick up a new or replacement card from the Campus ID Card Office in the Shop usask Bookstore, located in Marquis Hall. From August 27 to September 7, the Campus ID Card office is temporarily located in Upper Place Riel. Hours are Monday to Friday from 8:30am to 4pm. When you pickup your card, you'll need to show government issued photo-identification such as a driver's license or passport. We also ask that you remove your headwear for the photo unless it is worn for medical or religious reasons. If you attend an off-campus site, you can arrange for a card through your local U of S advisor. You'll be able to order your card online and pick it up at your campus. The U-Pass is your Saskatoon Transit bus pass. To find out bus schedules, what busses to take and where the bus stops are, use the Transit app. The cost of the U-Pass is automatically included in undergradaute and graduate student fees. However, students with special circumstances may apply to opt-out of the U-Pass service. U-Pass stickers must be picked up or reactivated at the Information Centre in Upper Place Riel. Students must reactivate their U-Pass sticker each term. You need your Student ID Card before picking up your U-Pass. To use your U-Pass: Place your card on the card reader when you enter the bus.